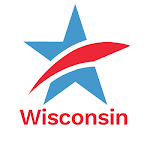 Tuesday's 90-page decision by Federal Judge Lynn Adelman in Milwaukee on Wisconsin's 2011 photo voter ID law, Act 23 – the most extreme and restrictive voting legislation in the nation at the time – was not a total surprise. But not only did it strike down Act 23 for violating Section Two of the Federal Voting Rights Act and not providing equal protection to all Wisconsin voters under the law, but it also exposed and demolished the long-perpetuated myth that such a measure is needed in order to prevent "voter fraud." In the present case, no evidence suggests that voter-impersonation fraud will become a problem at any time in the foreseeable future. As the plaintiffs’ unrebutted evidence shows, a person would have to be insane to commit voter-impersonation fraud. The potential costs of perpetrating the fraud, which include a $10,000 fine and three years of imprisonment, are extremely high in comparison to the potential benefits, which would be nothing more than one additional vote for a preferred candidate (or one fewer vote for an opposing candidate), a vote which is unlikely to change the election's outcome. This is significant. For years, this has been the "rationale" by proponents of this legislation and for years they have been utterly unable to produce any evidence of extensive – or even measurable voter "fraud." They have simply invented the "possibility" that such "fraud" might exist. Obviously, this is not a rational basis on which to enact a law that affects the most basic act of citizenship – voting – in a representative democracy. For news accounts of the decision go here and here. Common Cause in Wisconsin (CC/WI) is cited here. CC/WI opposed this measure in 2011 and opposes it today. It is as fraudulent as the "fraud" it seeks to prevent. In 2012, we submitted an amicus brief in opposition to Act 23. That brief, and the case was written and argued in magnificent fashion by the legal team of John Ulin of Los Angeles and Chuck Curtis of Madison – both from the Washington, D.C. - based law firm of Arnold & Porter, together with Dean Strang of the Madison law firm of Hurley, Burish & Stanton. Ulin's statement about the case is contained in this release. Wisconsin Attorney General J.B. Van Hollen has already announced his intention to waste more of Wisconsin's taxpayer dollars by appealing Judge Adelman's decision. The case will likely then be reviewed by the Federal Court of Appeals for the 7th Circuit in Chicago. There is good reason to believe that the 7th Circuit could uphold Adelman's decision. Wisconsin's current voter photo ID law is dead unless the 7th Circuit reverses today's decision. Another case before the Wisconsin Supreme Court would be moot if the 7th Circuit upholds today's monumental ruling. We like our chances. Of course, the matter will not end there. Governor Scott Walker has already announced his intention to call the Wisconsin Legislature back into Special Session late this Spring or Summer for the sole purpose of passing and enacting into law a revised voter photo ID law for the purpose of bolstering his own re-election prospects and those of his Republican allies in the Legislature. They will say it is to "prevent voter fraud" but anyone who truly believes that is also likely to invest their life savings in Beta Video Recorders and Eight-Track Tape players. Not a wise bet. 1. The sudden and sad end of the political career of Senate President Michael G. Ellis (R-Neenah) ought to bring joy to no one – although there are plenty of folks on both the right and the left who are no doubt very happy. We're not. We worked closely with him for many years because he was, for many years, the "go to" legislator on political reform. And he understood the necessity of reaching bipartisan compromise to achieve effective, lasting political reform. This is a concept far too many on both sides of the political divide don't even comprehend, let alone do. And we are the poorer for it. And we are more polarized and distrustful and uncivil than ever. So the loss of Mike Ellis is huge. CC/WI Director Jay Heck knew Mike Ellis very well and CC/WI Board members Bill Kraus and Dave Martin, even better. We worked closely with him on political reform issues for more than a decade. Here are Heck's reflections on last week's incredible chain of events – a combination of public and personal observations. And here are Bill Kraus' thoughts on Ellis' departure. There was a lot of media coverage about the unexpected Ellis exit from Wisconsin politics and therefore considerable comment from CC/WI because of the close working relationship we had with him for many years. For reaction from Jay Heck in The Capital Times go here. For television coverage go here, here, and here. For Wisconsin Public Radio coverage, go here. For additional radio coverage, go here, here and here. 2. A capacity audience of approximately 130 citizens – a great mix of people from Eau Claire and outlying areas, as well as students turned out for a lively forum discussion of political reform issues at the University of Wisconsin-Eau Claire last week. Panelists included State Representative Dana Wachs (D-Eau Claire), State Senator Kathleen Vinehout (D-Alma) and former State Rep. Jeff Smith (D-Eau Claire), as well as Jay Heck. 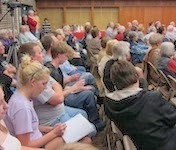 Four other area legislators were also invited to be panelists but declined our invitation. 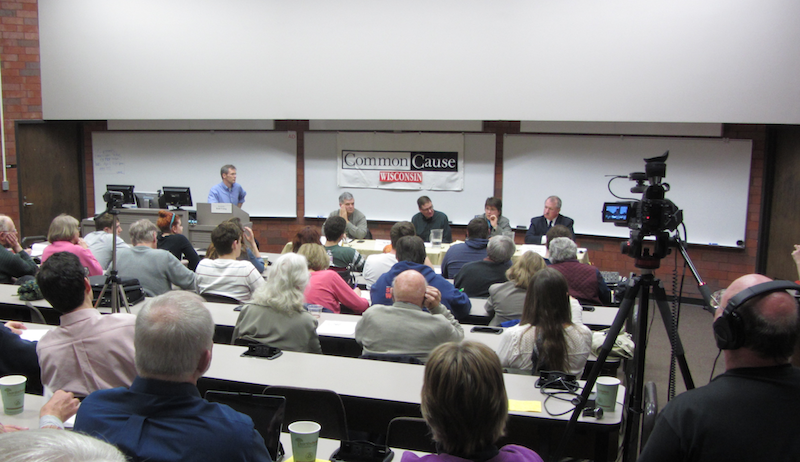 UWEC Political Science Professor Rodd Freitag ably moderated the event and helped organize it. The dire need for non-partisan redistricting to be in place by 2021, as well as renewed efforts to make it more difficult for Wisconsin citizens to be able to vote, and the most recent and misguided U.S. Supreme Court decision on money in politics, McCutcheon vs. F.E.C. were the "hot" topics of discussion. There were also suggestions about what citizens can do to advance reform and to fight back against voter suppression measures and the increasing and corrupting money in our politics. For media coverage, go here and here; the forum was filmed in its entirety by Chippewa Valley Community Television and will be available to watch later this week on their website here and then will be posted on our website. Another CC/WI reform forum is being planned now – perhaps in a community near you – so check our website often for details. The Roberts Court today continued its drive to give Americans a government of, by and for big money. “Today’s decision in McCutcheon v. FEC is Citizens United round two, further opening the floodgates for the nation’s wealthiest few to drown out the voices of the rest of us,” said Miles Rapoport, president of Common Cause. Thanks to today’s decision, a politician can solicit from a single donor a $3.6 million check for party committees and federal candidates, consigning to background noise the hundreds of millions of Americans who can’t afford to give more than $5, $10 or even $100 to parties or the candidates of their choice. “This is a return to the ‘soft money’ era, in which donors could hide six- and seven-figure gifts to individual candidates by donating the money to joint committees or party committees that simply passed it to the intended recipient. It is naïve to think that such vast sums of political money do not buy special access and favors,” said Rapoport. Whether in Washington, at the State Capitol in Madison, or at city hall, major donors routinely get major access to the officials their money helps elect; their lobbyists are invited to help write and amend laws that impact their businesses, and they are rewarded with government jobs, contracts and tax breaks. This system already has helped produce economic inequality unlike any seen in America since before the Great Depression; the court today almost certainly made it worse. “Today’s ruling makes it clear that, with the current U.S. Supreme Court, the only way to get meaningful campaign reform is by passing a constitutional amendment authorizing Congress and the states to limit campaign spending,” said Rapoport. Common Cause-backed resolutions calling on Congress to pass a constitutional amendment have been approved by voters, state legislatures or local governments in 16 states and hundreds of localities coast-to-coast. In addition, Common Cause will continue to push for public financing of campaigns at the federal, state and local levels, as well as improved disclosure of political money. Moderates Feeling Pressured Out Of State Legislature?